As I was browsing through the posts last week, the table redo from Living A Creative Bliss caught my eye. I love this because it really hit home. A few years ago my hubby and I started shopping for a new kitchen set. The more we looked, the more we realized what a waste of money we were considering. Our table was perfectly fine, just a little dated. With a lot of hard work, sanding, painting, and staining, we LOVE our set. 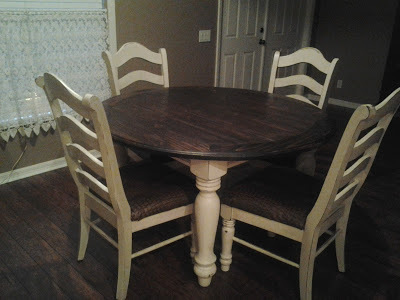 This kitchen table set by Living a Creative Bliss, turned out beautifully! Onto Home and Family Friday! I can’t wait to see what you have for us this week. We love to see recipes, crafts, room makeovers, or all sorts of things you’ve done at home or with your family. 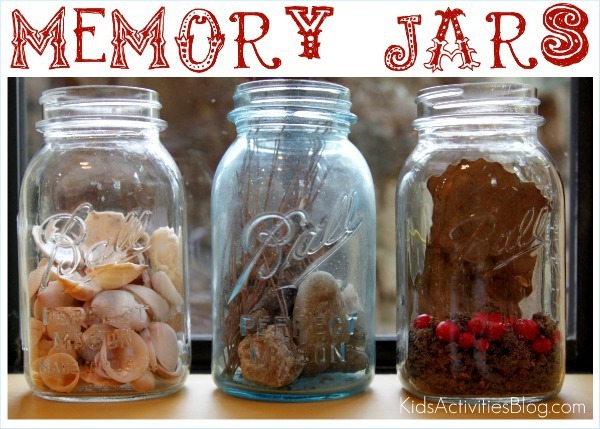 I absolutely love this idea, to Make a Memory Jar. Kids Activity Blog could be my new favorite place to visit. I’ve always been a collector of “treasures” like shells, sand, rocks, and other really important things. My husband loves the fact that I store most of these treasures in bins in the garage. My daughter seems to be the ultimate collector as well. She started getting tired on the last hike we went on. Pretty soon, we noticed that her coat was looking very heavy. She had been collecting pretty rocks and saving them in her pockets! I can’t wait to see the fun activities you have to share this week! We love to see recipes, crafts, or projects you’ve done around the house or with your family. I would be so happy if you’d grab my button and become a follower. It just makes me feel happy. I’m on Facebook too, if you’d like to follow along there as well. It’s time for a party. Link up the projects you’ve been doing around your home or with your family. I’d love it if you’d become a follower and grab my button. Don’t forget – I’m on Facebook too. The link is on the right side of my blog. I post different things on there, so you may want to take a look. We’re ready to see what you’ve been up to this week. We love to see great recipes, projects, or anything you’ve been doing around your home or with your family. I’d love it if you’d become a follower and grab my button. Hello, Friends! We’ve had a busy Spring Break and we’re recovering from a two day getaway. Enjoy the linky party! I’d love it if you’d become a follower and grab my button. 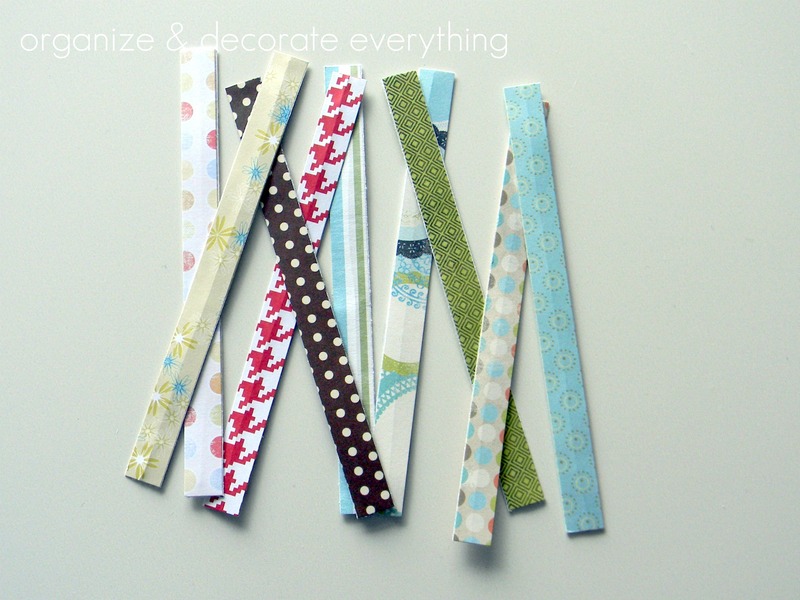 We love to see crafty projects, recipes, or anything you’ve been doing around your home or with your family. I just realized that I posted all about my road out of the depths of fever, infection, and doctor visits, but I didn’t share any pictures. I figured I’d better show you something from my week of rest. So, I started thinking about all of the cute outfits that I pin on Pinterest. That lead to thoughts of people who post “what I wore Wednesday” pictures. You know, those cute skinny girls who take a picture of their outfits in the mirror and tell us where they bought everything. And here’s another cute ensemble. Don’t you love the way they even include the fluffy Starbuck’s drink? I thought I’d show you (Pinterest style) what I wore all week. Day after day. So here it is! Yep, that’s my basic long sleeve white t-shirt. I believe they are from the Land’s End department of Sears. The yoga pants are the Tek Gear brand from Khol’s. The slippers in the picture are actually Uggs. Mine are just the Costco knock-offs. Oh, and don’t forget the accessories. 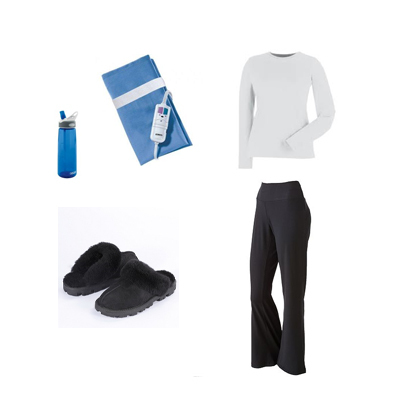 The outfit wouldn’t be complete without the water bottle and heating pad. Ya know, just thought you’d like a glimpse into my life last week. Feel free to pin that outfit onto your My Style Pinterest board, friends! We’re ready for Home and Family Friday. I hope you’ve been crafty this week because I haven’t. 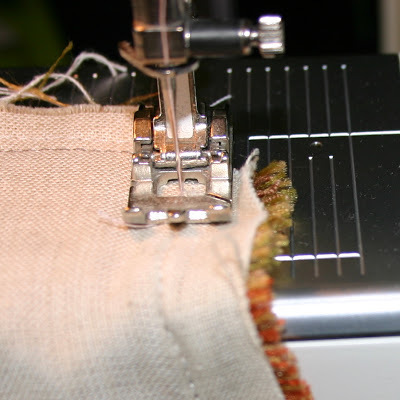 Link up a project you’ve been doing around your home or with your family. I’d love it if you’d grab my button and become a follower. Did you see Leanne’s twist ties last week? I love this idea. It’s quick, easy, and cheap! It’s time to link up your projects! We’d love to see anything you’ve done around your home or with your family. I would appreciate it if you’d grab my button and become a follower. Don’t forget to stop by a few other links and leave comments. We all like positive feedback! Last Friday, one of my favorite posts was also one of your favorite posts. 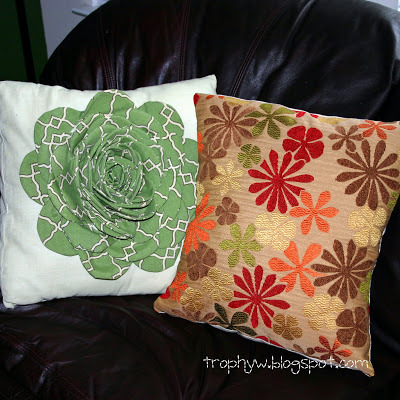 Sewing 101 from Tales From a Trophy Wife is a great tutorial on how to make a basic pillow. I can’t wait to see what you have for us this week. We love to see recipes, home decor, arts and crafts, or any project you’ve been doing around your home or with your family. I’d love it if you’d grab my button and become a follower. While you’re at it, come visit me on Facebook. The link is on the right side of my blog. 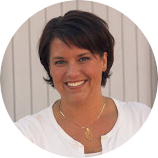 One of my favorite things about hosting a linky party is featuring a talented and crafty blogger. I know how excited I was, the first time I was featured on a blog! Here we are, Thursday night, ready for a feature and I’m out of energy. Teaching all day, and Open House in the evening, have me wiped out. There’s always next week, or maybe Saturday. Happy Friday! Link up, Friends!